The group that launched a $5 million campaign to combat liberal bias in the media last month sent a letter late Monday to network chiefs at ABC, NBC, CBS and CNN, blasting the collective lack of coverage of what it calls the Obama administration's "assault on religious freedom." The Media Research Center says the networks have failed to report on the Obama administration's decision to require church-affiliated employers to cover birth control, while coverage of the Susan G. Komen Foundation's defunding of Planned Parenthood has dominated the airwaves. Brent Bozell, head of MRC, sent letters to the news division presidents of the aforementioned networks (NBC News' Steve Capus, ABC News' Ben Sherwood, CBS News' David Rhodes and CNN's Jim Walton) demanding coverage of the administration's "Catholic attack," and calling their "obsession" with the Komen story "glaring." "The double standard is clear for all to see," Bozell wrote. "You are ignoring the attack on the freedom of religion by the Obama administration, but coming to the aid of Planned Parenthood because you agree with them." According to MRC's count, more than three-quarters of the quotes used in the Komen coverage favored Planned Parenthood. Representatives for ABC, NBC, CBS and CNN did not immediately respond to requests from Yahoo News seeking comment. The broadcast and cable television networks need to report the current, unprecedented assault against freedom of religion in this country, as well as the millions of Americans who would be left out in the cold by the Obama administration if it does not rescind HHS's recently issued insurance mandate requiring contraceptive coverage. As our statistics and analysis below outline, they are not, and it's a glaring double standard. First, allow us to offer perspective on whom this new mandate affects. There are more than 65 million Catholics in the United States. Collectively, they operate more than 7,000 Catholic schools to educate children of all faiths and backgrounds. They also manage hundreds of health care facilities. In fact, one in six patients in the United States is cared for in a Catholic hospital. All of these institutions and countless other Catholic-run charities will be forced to close their doors — or forfeit their most fundamental and deeply held religious beliefs if the Obama administration's new mandate is not rescinded. The mandate forces these religious institutions to provide insurance covering sterilizations, abortion-causing drugs and artificial contraceptives, all of which fly in the face of Catholic teaching. Yet to date, the broadcast networks have nearly ignored it. In contrast, in reaction to a decision that would affect vastly fewer potential patients, the networks pounced on the Susan G. Komen Foundation's decision (now overturned) to cease a measly $480,000 in a grant to Planned Parenthood, the country's largest abortion provider. That stands in sharp contrast to the decision of the private Komen Foundation, when these same networks almost instantly piled on with publicity that helped fill Planned Parenthood's coffers and added to the pressure that forced Komen to reverse. 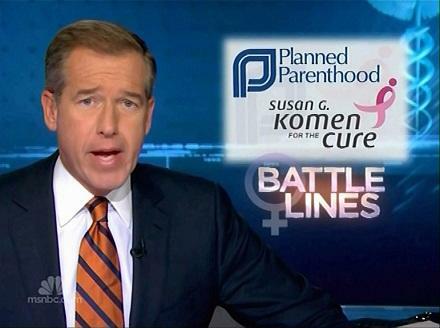 In fact, as of February 5th, ABC, CBS and NBC covered the Komen controversy six times more than the anti-Catholic HHS law. New York Archbishop Timothy Dolan has said this new law "is as much an attack on access to health care as on religious freedom" and bishops across the country have issued the strongest letters in memory condemning this assault on religious liberty. Indeed, non-Catholic institutions across the country have joined the Catholic Church in condemning the administration, so you have no lack of experts and interviewees to discuss this outrage on-air. The double standard is clear for all to see. You are ignoring the attack on the freedom of religion by the Obama administration, but coming to the aid of Planned Parenthood because you agree with them. Your network must cover the administration's insurance mandate accurately and comprehensively for what it is — an unprecedented assault against religion and a devastating blow to the millions of American school children, sick, elderly and poor of all religious faiths that are served by these Catholic institutions. If you refuse, and limit your networks to reporting about the Komen Foundation's decision to pull funding from Planned Parenthood, then you cannot be seen as anything but an anti-Catholic, pro-abortion advocate. I woke up to see this MRC press release/letter to network presidents criticizing the television networks for ignoring the fact that the healthcare law requires Catholic institutions to provide birth control as a part of their healthcare coverage. (http://www.mediaresearch.org/press/releases/2012/20120206020329.aspx). I was surprised to see that your letter and press release included CNN and said that according to MRC, we (along with others) had effectively ignored the story. In fact, CNN has done that story numerous times on TV and online, particularly after the HHS secretary announced the administration's position on the policy on January 20th. An important example was a lengthy piece on this subject by our White House Correspondent Brianna Keilar that ran a number of times last week and all weekend long. In addition, here's a link to a CNN story on the controversy that appeared on CNN.com on January 20th; that story incorporated both the Obama Administration position and the statement of Cardinal-designate Timothy Dolan: http://on.cnn.com/w35GGP. Beyond that, CNN did a separate piece about the political implications of the Obama Administration's policy: http://on.cnn.com/w35GGP. And here is an additional piece that CNN's religion editor did from the perspective of Catholic religious leaders: http://religion.blogs.cnn.com/2012/01/30/catholic-clergymen-come-out-swinging-against-hhs-regulation/. We would respectfully request that you update your story and credit CNN with being among those that have been out front on this important story. CNN's mission is simple: to provide our viewers and our online readers news on important and controversial issues without taking sides.